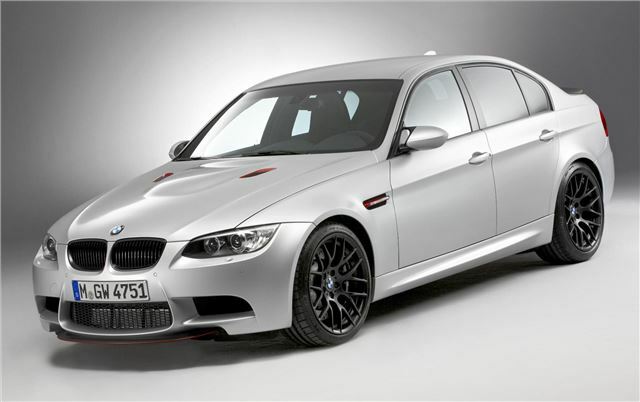 BMW is to make just 67 examples of the M3 CRT, a super lightweight version of the M3 sports saloon. The CRT uses carbon reinforced plastic (CRP) body parts to keep the weight down, improving the power to weight ratio. Thanks to the weight reduction the M3 CRT is 100kg lighter than a standard M3, and that means a 0-60mph sprint of 4.4 second sprint to 62mph, 0.3 seconds quicker than an M3 Auto, and 0.5 seconds quicker than the manual. To further reduce weight the front seats are made from cellular carbon honeycomb, a material which will appear in the i3 and i8 models which are set to go on sale in 2013. These new models will also feature CRP body panels, as well as hybrid or electric powertrains. The M3 CRT is powered by a V8 engine which produces peak power of 450hp at a screaming 8,300rpm. Peak torque is 440Nm, available at 3,750rpm. Power is transferred to the rear wheels by an M double clutch gearbox with launch control facility. The suspension has been tuned specifically for this model to improve rigidity, and adjustable dampers are fitted for track day lovers. The CRT is available in Polar White with red details to set the model apart from standard M3s. There are no details on pricing or UK availability as yet.